Upright Row: Stand straight, hold a weight hanging down in the hands, and then lift it straight up to the collarbone without any jerk is the way in which upright row exercise is performed. This weight training exercise involves trapezius, upper back, forearms, triceps and biceps and is a compound exercise. Dumbbells, barbell, Smith machine or cable machine can be used as training equipment. If the performer wants to exercise the trapezius muscles more then just narrow the holding grip. Shoulder Press: It is a compound exercise that is particularly done for strengthening of shoulders. But it also works for trapezius and triceps. During shoulder press, one has to lower the weight, held above the head, to a postion just above the shoulders and then bring it back to the original posture. This weight training exercise can be done while sitting or standing. Military press: It is one of the most effective compound exercises of upper body weight training. 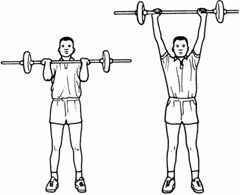 Performed in much similar way like shoulder press, the only difference is standing position with feet together. A major modification if required is Arnold Press in which dumbbells are raised while rotating the palms outwards. Dumbbells, kettlebells, barbell, Smith machine or shoulder press machine any of these equipment can be used to perform this deltoids exercise. Lateral raise: Also known as shoulder fly, this upper body weight training exercise is executed both in standing and seated posture. Hold the weight in hands and lift them out to the sides up to the level of the shoulders, hold the position and return back to the starting posture. While moving upwards, turn the hands position downward from the inside side. Lateral raise is an isolation exercise that mainly focuses on the deltoids but also works for forearms and traps.Equipment used for training are dumbbells, cable machine or lateral raise machine.